The Conanp announced via press release the new criteria for the tourism management of the Islas Marietas National Park, an icon of the Riviera Nayarit. 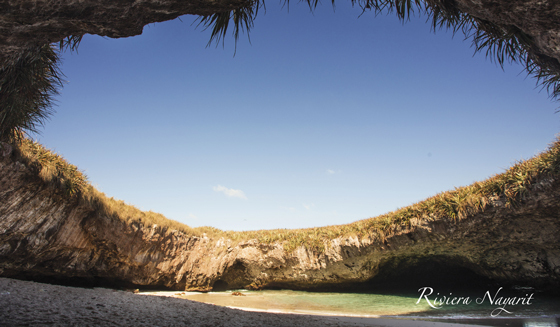 The National Commission for Protected Natural Areas (Conanp, by its acronym in Spanish) announced via press release the reopening of the Playa del Amor, part of the Islas Marietas National Park and an icon of the Riviera Nayarit, located across the coast of Banderas Bay. Tourists will be welcome once again starting August 31, 2016. Playa del Amor was closed to tourism May 9th of this year in order to begin a coral restoration program. The Conanp designed a more orderly, sustainable program for visits, including a special agreement with tour operators. The established criteria for visits to Playa del Amor includes a maximum of 116 visitors per day; 15 people maximum per boat; no more than 15 people at a time are allowed on the beach and they can only remain for 30 minutes; access will be via a corridor marked by buoys and passengers must wear life jackets and no fins. Scuba and/or diving of any kind are prohibited. The document went on to detail that both natural phenomena and bad tourism practices affected the coral colonies in the area, and that thanks to the restoration program over 50% of the coral planted had adhered successfully to the marine substratum. Another relevant aspect is the opening of the Trail (Sendero) in the Islas Marietas, which will be an alternative for sustainable tourism, much like Playa la Nopalera and the Interpretative Trail on Isla Larga, among other places ripe for exploration. Click here for a look at the official press release from the Conanp: http://www.conanp.gob.mx/difusion/comunicado.php?id_subcontenido=1068.